No, I have not lost my mind nor have I put skis on the Jeep. Earl and I have also not attached antlers on our cat, Pierre, or tied a red, glowing ball on his nose. But we did visit the North Pole this week and had Christmas in July. 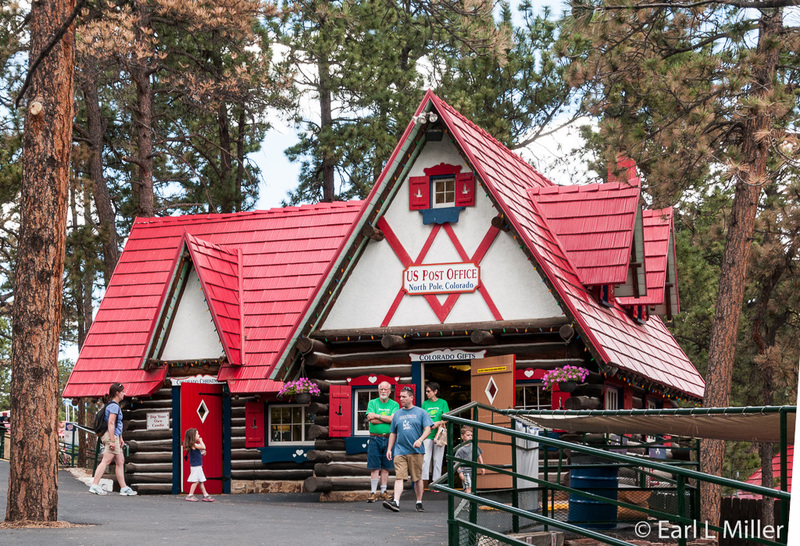 The Santa’s Workshop, North Pole is a family-run 25-acre amusement park in nearby Cascade. Tom and Susie Haggard operate this attraction which Tom’s father, George, started in 1956. Tom runs it while Susie is a shopper for the park. Their daughter, Austin, is the primary shopper while their son, Shannon, is responsible for the food service. “We are here for families - our goal and our mission,” said Austin. 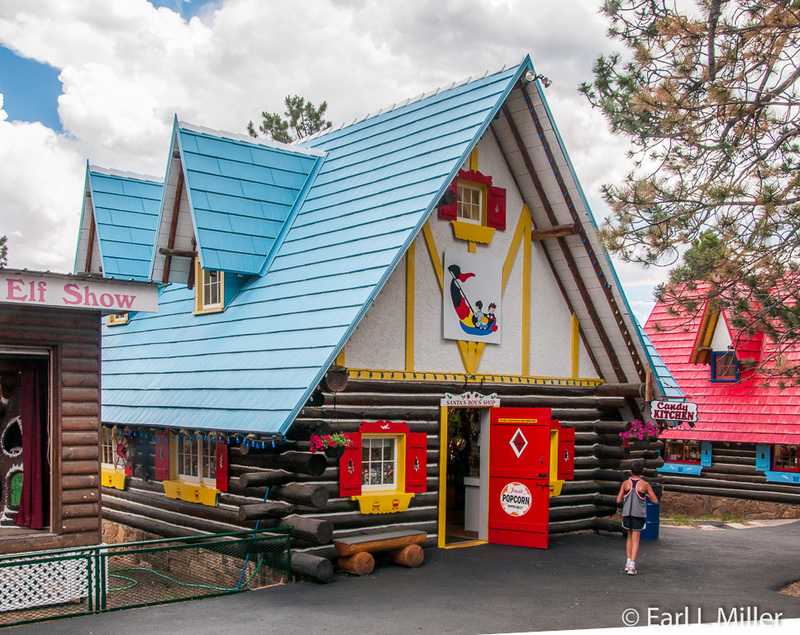 “We do everything we can to keep our park reasonable.” It’s evident not only in the variety of rides offered but in free parking and decent prices for food and souvenirs." They allow families to bring their own food for picnics. The only restrictions are no glass, alcohol, or fires. Walking around the park and talking to staff, I find the family spirit is two-sided between the Haggards and their staff. Tina, in the Girl’s Shop, told me she had worked there as a teenager. After retiring from another career, as a senior, she has returned. Many staff, I was told by management, have been at the North Pole for years. This kind of contentment is felt by visitors, making it easy to understand why this park has survived three generations. 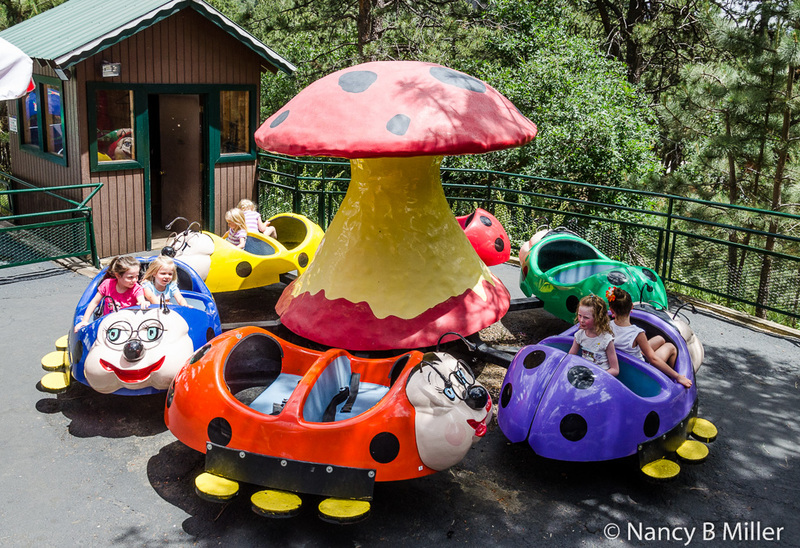 The park’s 28 rides are geared to ages two to ten. They have a few to keep the older youngsters interested but no thrill rides. The Sky Ride (cable car) requires an adult to ride it as does their 60-foot Ferris wheel, the Giant Wheel. Seven rides are for children only. Some rides are themed such as the Candy Cane Coaster; Christmas Tree Ride, which rises and falls; and a popular Peppermint Slide. They have a Herschell Spillman carousel circa 1919 with hand carved horses. The Haggards added reindeer to fit the theme. It’s been at the North Pole since the early 1960's. The newest ride is Santa’s Sleigh which is a Soaring Eagle Zip Line with a custom sleigh frame. Two people, at least 42" tall, may ride at one time. One must be at least age 16. You can watch Elmer, the animated, singing elf, for eight minutes and usually see a glassblower at work in his shop. A face painter is seasonal. 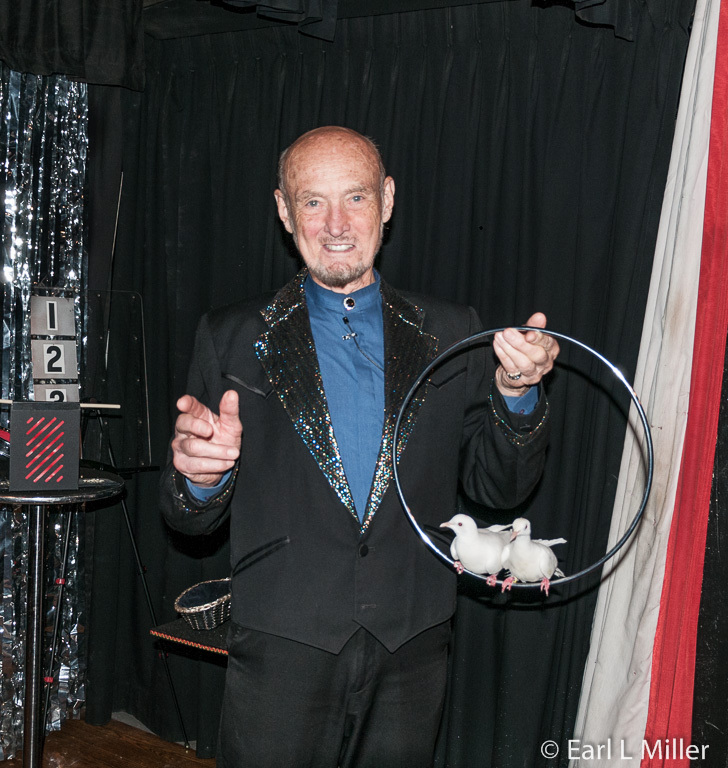 Max Armstrong stars in a very good magic show. He does a wide variety of tricks which hold the audience’s attention. These include working with large playing cards to magically appearing doves and joining together solid steel rings. Using a young boy from the audience as an assistant, Armstrong made quarters appear from nowhere that clanged into the can he was holding. He has appeared at the North Pole since 1968 and works Memorial Day to Labor Day. You can catch his 17-minute show daily, except Tuesdays, at 11:30 a.m. and 1, 2, 3, and 4 p.m. I would have liked to see more in the way of shows - perhaps, some live musical entertainment. Also, it would have been great fun to see some staff, dressed up in costumes of elves or reindeer, wandering the park. The park has several places to obtain food. Mother Hubbard’s Kitchen next door to the Christmas Shop is open all summer and weekends in the fall. You can purchase drinks, snacks, and lunch items. The Sugar Plum Terrace sells funnel cakes while Piccadilly is the place for pizza. At the Ice Cream Parlor and Café, they offer a variety of hand-dipped Blue Bell flavors. You’ll find a Candy Kitchen in the Boy’s Shop. They sell several varieties of fudge as well as Jelly Bellies. We purchased from Little Miss Muffet’s Snacks combination platters. We each had a hot dog, fries, and coke for $5.75. They sold burgers, cheeseburgers, and chicken nuggets. These were available for a combination around $7. All foods can be purchased individually. For those bringing children and grandchildren, this is a great deal. For those who want to do their Christmas shopping in advance, the North Pole provides several possibilities. The largest gift shop, carrying gifts found in the other stores, is at the main entrance, outside the entrance gate. 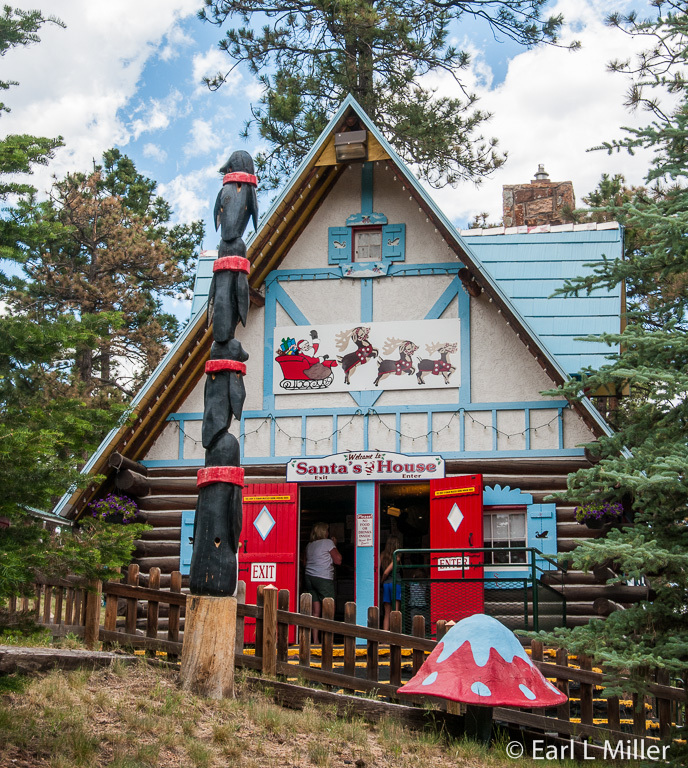 Santa’s Souvenir Shop sells Colorado and North Pole logoed tee shirts, sweatshirts, and blankets as well as souvenir bears. It also features Santa’s Photo Shop. At the Glassblower Shop, I was enchanted with the ornaments, bells, and Christmas trees - all made from glass. The Tepee is a seasonal Native American goods shop. The Personalization Shop concentrates on items with names. The Alpine Village of shops has several to visit. Check out the Girl’s Shop for a selection of toys which girls love and small handbags in the shapes of creatures. I noticed in the Boy’s Shop toys which attract them. A Christmas Shop, sells all kinds of ornaments, figurines, and Nativity sets. It houses 23 decorated trees. At the post office, you can mail letters stamped North Pole. It’s also the location to purchase Colorado souvenirs. While in the Village, be sure to look in the Santa Claus Chapel. Just above the Alpine Village, children can visit Santa Claus. I found him dressed in his workshop outfit rather than his well-known red suit. While in line, I had a chance to visit with a young family, Andrew and Chrissi Batzel, from Biloxi, Alabama, who were here with their mother who lives in Manitou Springs. 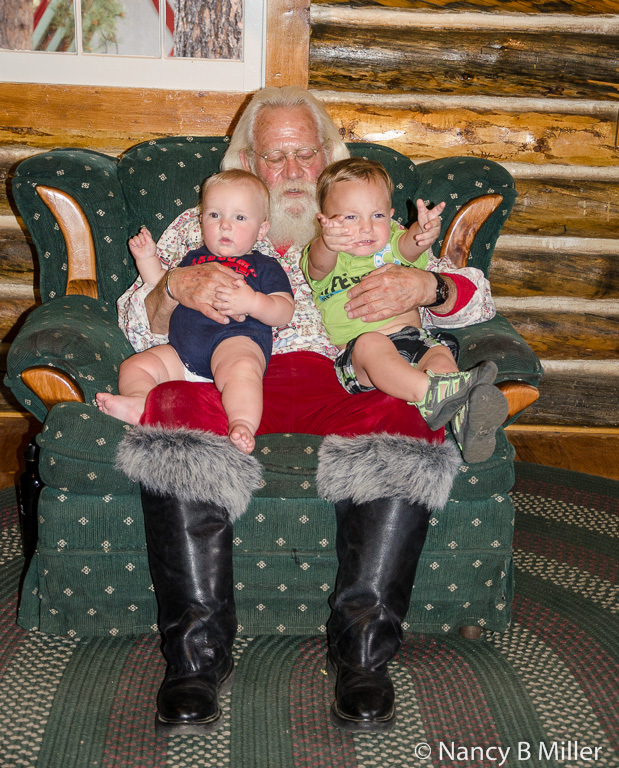 I took photos of their children, 9-months old Channing and 23-months old Preston with Santa. Admission includes visiting an area where you can feed llamas and goats. An Arcade/Skeeball building is also on the property. Keep your eyes out for the special instruments you’ll see. One is a North Tonawanda, New York Band Organ, circa 1920. It has 97 wooden organ pipes which simulate several instruments. It plays ten tunes from a paper music roll. A Wurlitzer Military Band Organ, made in 1907, originally sold for $775. It was in Amarillo’s Wonderland Park from 1958 to 1980 and Dallas’s former Penny Whistle Park from 1980-1995. It came to the North Pole and was restored in 2003. You should expect to do a lot of walking with an abundance of stairs and ramps. At the entrance, they do have a handout for seniors and the disabled mapping out better routes around the property. I would have appreciated a train or cable car that have depots at the park’s rear attractions. Unfortunately, though management has talked about doing this, these rides run only non stop from the front of the park. 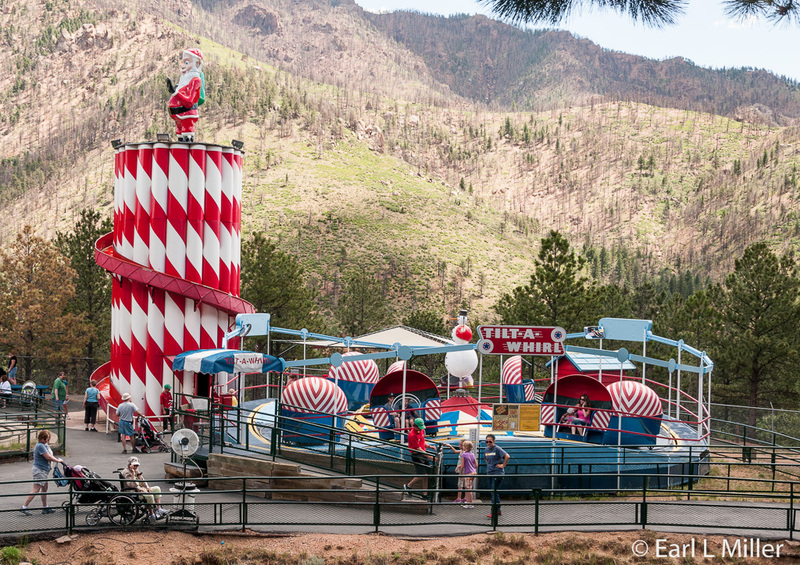 The North Pole is open daily from Memorial Day until August 18. Then the schedule until December 24 is daily, weather permitting, except for closures Tuesdays and Wednesday. It is closed on Thanksgiving. After December 24, the park shuts down for the season. It is cashless within North Pole. You are handed a ticket on which your purchases for everything are listed. Your ticket is your way out at the exit, where you pay before leaving. Admission is $21 for ages two to fifty-nine. Under age two and ages 60 and over are free. A $3 discount coupon, good for up to ten people, is available on their web site, www.northpolecolorado.com. Their address is 5050 Pikes Peak Highway, Cascade, Colorado. The phone number is (719) 684-9432. For breakfast, we discovered Over Easy at University Shopping Center, 5246 N. Nevada Avenue. They specialize in using local ingredients and creating large portions. You can order one to three made-from-scratch gourmet pancakes. Three fill a large oval platter. It’s also the place for Stuffed French Toast, Eggs Benedict, and Breakfast Quinoa. For lunch, they have a variety of sandwiches and salads. This restaurant caters to vegetarians and guests seeking Gluten free dishes. Cyndy, our waitress, was amazing - anticipating all our needs the two times she was our server. They are open Monday to Friday 7a.m.to 2p.m. ; Saturdays and Sundays from 7 a.m. to 2:30 p.m.
For lunch, we recommend Marigold Café and Bakery, a Colorado Springs restaurant since 1992. This restaurant has won in 2014 Best Desserts and Best Bakery in Colorado Springs. Their chef/owners, Dominique, and his wife, Elaine, worked at the French pavilion at Epcot Center in Orlando. He trained in France and she studied at the Culinary Institute of America. The menu is a French Bistro-inspired menu with daily specials. Dinners are pricey ranging from $13 to $35. Lunch, with few exceptions, is less than $10. Don’t miss their desserts as they have an in-house bakery. Our server, Nancy, was excellent, the two times we ate there. You’ll find them at 4605 Centennial Boulevard. NORAD, now stationed at Petersen Air Force Base, instead of Cheyenne Mountain in Colorado Springs, traces Santa’s annual flight around the world.